Sculptures which reflect Chinese artists' feelings about ethnic diversity are on show at the National Art Museum of China in Beijing. An exhibition of sculptures celebrating the ethnic diversity and unity of the Chinese people is currently running at the National Art Museum of China. In a globalized age when people tend to think and live alike, it has become even more significant to preserve cultural diversity. Ethnic differences that are evident in people's looks, outfits, craftsmanship, entertainment and communication greatly constitute the depth and scope of Chinese civilization; and the coexistence of these distinctions forms the basis of national integrity. The celebration of such ethnic variety has played an important role in Chinese artists' work since the 20th century. Modern artists first discovered the richness of the historic and cultural legacies of China's ethnic groups in the 1930s, when they were forced to retreat to the hinterland of Northwest and Southwest China during the War of Resistance against Japanese Aggression (1931-45). Even now, contemporary artists still source inspiration from the diverse arts and crafts practiced by people inhabiting ethnic communities, as a way to breathe new life to these withering traditions which are often overshadowed by fast-paced urbanization. Regularly traveling to remote ethnic villages, sometimes for residence, is not an uncommon practice. 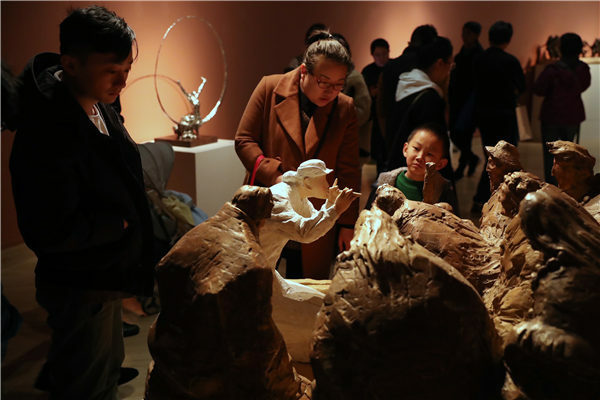 Dozens of sculptures which reflect Chinese artists' feelings about vibrant ethnic cultures are currently on display at an exhibition entitled Grand National Unity, which runs at the National Art Museum of China through March 24. The show inaugurates a series of exhibitions at the Beijing-based museum that will mark the 70th anniversary of the founding of the People's Republic of China this year. It represents the first time a national sculpture show dedicated to ethnic solidarity has been held, according to Wu Weishan, the director of the National Art Museum of China and a sculptor in his own right. "When hearing about ethnic groups, people expect to see paintings that depict their colorful costumes and magnificent living environments," he says. "It poses challenges for sculptors to approach the theme by creating work that is similarly expressive and eye-catching, which is not aided by an arousing palette, but an imaginative combination of shapes and materials and a smart play of light and space." The pieces on show date back to 1951, including Great Harmony, a white marble relief sculpture produced by eminent artist Wang Linyi. A work that depicts musicians of the Jing ethnic group by Huang Bingyi is on display. Wang, who was trained at the prestigious National High School of Fine Arts in Paris, was one of the pioneers of modern Chinese sculpture. His work depicts a jolly scene in which people from various ethnic backgrounds dance to music performed with different types of instrument. Wu says Wang's oeuvre of work shows the mastery of a figurative approach he learned in France fused with the grace and mellow mood of Eastern aesthetics. He says a similar ambition to establish a modern Chinese view on beauty and to serve ordinary people is shared by several artists, including Liu Kaiqu, who also studied in Paris and was the first director of the National Art Museum of China. Liu sculpted several monumental works that hail national independence, including the design of the reliefs on the Monument to the People's Heroes, located in the Tian'anmen Square. His work on show, however, is a small white marble sculpture of a Tibetan yak. The smoothness and soft sheen of the yak reminds one of the presentation of hada, a pure white ceremonial scarf, or the snow-capped mountains and curling clouds in the Tibetan area. Wu says Liu rendered the yak with the imposing manner of a monument, which shows his studies of Western sculpture, but he also imported a touch of Chinese poetry to reinforce its divine spirit. When the art community began to explore an abstract, experimental style, Tian Shixin was an prominent figure. Born in Beijing, he created figurines that are reduced in detail and feature clear-cut lines to present the objects' spiritual energy. He based his creations on the rich ethnic arts of Guizhou province in Southwest China, where he lived for about 25 years before moving back home in the 1980s. 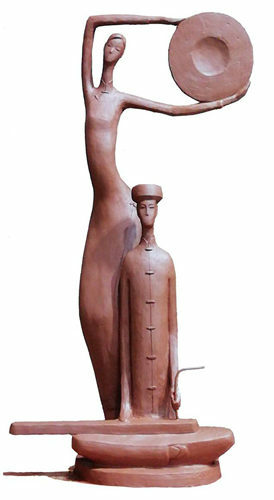 Tian has for decades produced a series of wood statuettes of ethnic people he met in Guizhou, including the wood sculpture on show, Column of Joy, which portrays a young mother of the Dong ethnic group lifting her child above her head. He sculpted the work in the shape of a cylinder, reminiscent of a totem pole or a monument, by which he hails motherhood. Tian says, "The years living in Guizhou were a time when I felt relaxed and daring, and ultimately devoted to nothing but pure art. I haven't felt the same while in Beijing."